Stephen Hawking (born 8 January 1942) is an atheist, physicist, cosmologist, author and Director of Research at the Centre for Theoretical Cosmology within the University of Cambridge. 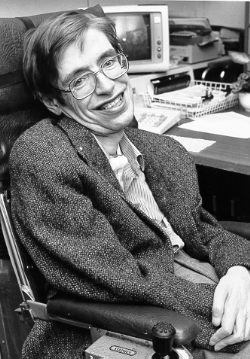 Despite suffering from Amyotrophic Lateral Sclerosis for most of his adult life he has written books popularizing science. His most famous books are A Brief History of Time, Black Holes and Baby Universes, The Universe in a Nutshell and The Grand Design, in which he argues against the idea of the need for a Creator. In his new book, The Grand Design, Stephen Hawking writes: "Because there is a law such as gravity, the universe can and will create itself from nothing." Stephen's latest quote was that heaven is a "fairy tale" for those of us that are "afraid of the dark." Stephen Hawking is an idiot and a fool! (Reuters) - God did not create the universe and the "Big Bang" was an inevitable consequence of the laws of physics, the eminent British theoretical physicist Stephen Hawking argues in a new book. "Because there is a law such as gravity, the universe can and will create itself from nothing. Spontaneous creation is the reason there is something rather than nothing, the reason the universe exists, the reason we exist." I may not be smart enough to understand how relativity, quantum mechanics and gravity do or do not work together to form a "complete theory", but I am smart enough to recognize a fool in willing denial! Spontaneous creation is basically a contradiction in terms. While spontaneous actions occur with no real planning, the word "create" implies an act of will to design, to modify, to arrange something. How can nothing "spontaneously create" something? Even Hawking's partial sentence "the universe can and will create itself" implies a paradox: how can something that doesn't exist "do" anything, much less "create" a universe? Hawking isn't using a "which came first, the chicken or the egg?" argument: he's saying there was no chicken or egg, until the chicken and egg created each other. Sorry, Stephen, but you're an idiot if you really believe that the universe could have created itself out of nothing. That's about as asinine as saying that DNA created itself at random out of a pool of goo…. Oh wait! People believe that too! My bottom line: the fool says in his heart there is no God. I understand that many people simply want to refuse to accept that there is a God since they are dishonest and of bad will and because they don't want to change from their sinful lifestyle. But if you boil it down to the question of "where did this all come from? ", the view that the universe, the world, and all living things just randomly popped into existence without some sort of creative "force" or "intelligence" (i.e., God!) driving or designing it doesn't make any sense. Stephen—your pride and refusal to accept that there might be a being out there that's more intelligent than you has blinded you, and you have no idea that your "spontaneous creation" theory is about as solid as a nebula, and definitely not worth observing from near or afar. You may be a brilliant physicist, but you're also a fool. For many years renowned physicist Stephen Hawking has been advocating his belief there is no God and that humans should therefore seek to live the most valuable lives they can while on earth. Mr. Hawking still believes life has value even in the absence of a Creator. The apostle Paul would disagree with Mr. Hawking for Paul notes that if there is no life beyond the grave, if there is no bodily resurrection from the dead, if the words of Jesus are not true, if God does not exist, then we should just eat, and drink, and be merry for tomorrow we die. Life has no ultimate and transcendent value or meaning. 1 Corinthians 15:13–19, "But if there be no resurrection of the dead, then is Christ not risen: And if Christ be not risen, then is our preaching vain, and your faith is also vain. Yea, and we are found false witnesses of God; because we have testified of God that he raised up Christ: whom he raised not up, if so be that the dead rise not. For if the dead rise not, then is not Christ raised: And if Christ be not raised, your faith is vain; ye are yet in your sins. Then they also which are fallen asleep in Christ are perished. If in this life only we have hope in Christ, we are of all men most miserable." Guardian newspaper columnist Ian Sample asked Mr. Hawking if he feared death. This was his response: "I have lived with the prospect of an early death for the last 49 years. I'm not afraid of death, but I'm in no hurry to die. I have so much I want to do first. I regard the brain as a computer which will stop working when its components fail. There is no heaven or afterlife for broken down computers; that is a fairy story for people afraid of the dark." I am glad Mr. Hawking does not fear death, but he should believe that God exists, he should fear God. Since Mr. Hawking has boldly and widely made known his judgment of God by teaching God does not exist and is a figment of people's imagination, it is only proper that God be allowed to respond and pass His own judgment on Mr. Hawking and let His view be made known. Simply enough, God looks upon Mr. Hawking as a fool. Psalms 14:1 says, "The fool hath said in his heart, There is no God. They are corrupt, they have done abominable works, there is none that doeth good." In biblical terminology a fool is a self sufficient individual and that is what Mr. Hawking is. He believes that matter plus time plus chance has brought the sum total of the universe into being. Mr. Hawking believes himself to be the product of a cosmic event without rhyme or reason for Stephen Hawking believes the cosmos exists apart from a transcendent Intelligent Designer. In his book The Grand Design, Mr. Hawking challenged Isaac Newton's theory that the solar system could not have been created without God. "Because there is a law such as gravity, the Universe can and will create itself from nothing. Spontaneous creation is the reason there is something rather than nothing, why the Universe exists, why we exist. It is not necessary to invoke God to. . . set the Universe going," he writes. At this point Mr. Hawking has gone from science to faith. His faith is in the eternal existence of matter. He does not ask where matter comes from for he does not care. He does not ask who created the "stuff" matter is made of for he does not care. All he wants to do is advocate his atheistic evolutionary religion, which is not being scientific. Not only does God view Mr. Hawking as a fool but God views Stephen Hawking as unwise. Proverbs 9:10, "The fear of the Lord is the beginning of wisdom: and the knowledge of the holy is understanding." While many people in the world view Stephen Hawking as a brilliant scientist, God declares him to be without the beginning of wisdom and without true understanding of the universe in which he lives or the God who created him and the universe in which he resides. Mr. Hawking's lack of spiritual understanding is revealed in his comparing the brain to a computer. In the nineteenth century the brain was compared to the circuitry board of the telephone in a large city exchange. The Bible says that man was made in the image of God and God is a spirit. Here is where true wisdom would begin the thought process and the making of analogies. If Stephen Hawking would use biblical terminology, biblical images, and engage in spiritual thoughts he would have different ideas and better conclusions. He would also have a new ground of faith. God would replace immaterial matter. In these final days of his life, as Stephen Hawking struggles with Lou Gehrig's disease, he should prepare to meet the God he does not acknowledge. "We should seek the greatest value of our action," Stephen Hawking once said. "But why?" the apostle Paul would ask? In the absence of biblical faith, in the absence of God, there can only be the sound of silence. Stephen Hawking has his opinion of God and God has His opinion of Stephen Hawking.